Tema LNG Terminal Company Ltd., an entity controlled by Helios Investments, the world’s largest Africa-focused private equity fund, on Sunday, 2nd September, 2018 signed an agreement with China Harbour Engineering Company for the construction of a Liquefied Natural Gas (LNG) Terminal in Tema. The LNG Terminal is being constructed on the back of a 12-year gas supply agreement that was executed between the Ghana National Petroleum Corporation (GNPC) and Rosneft, a global LNG trader and the world’s largest listed oil producer. Rosneft subsequently engaged Tema LNG Terminal Company for the provision of the re-gasification services. The LNG Terminal, which would be completed in 18 months, would be Sub-Saharan Africa’s first re-gasification terminal, strengthening Ghana’s position as a regional trade and energy hub. The project, which would generate some 1,600 jobs, is estimated to provide about two million tonnes of liquefied natural gas every year. This would mean that the facility would supply about 30 percent of Ghana’s total electricity generating capacity, displacing crude oil and crude derivatives as fuel sources for the generation of power. In addition, a concession agreement signed between the Ghana Ports and Harbours Authority (GPHA) and Tema LNG Terminal Company Ltd to allow for the siting and operation of the facility within the Tema Port will deliver an annual revenue in excess of $6 million to GPHA throughout the total concession period. 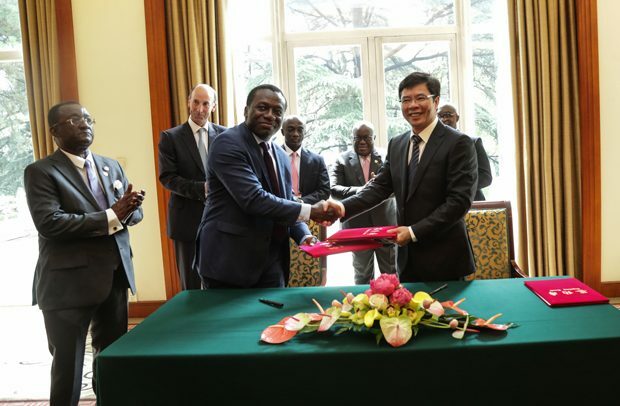 Witnessing the signing of the agreement, in Beijing, China, as part of his official visit to that country, President Akufo-Addo indicated that the Tema LNG Terminal Project is testament to the efforts his government have put in place over the last 19 months to encourage private sector participation in the growth of the economy. The Tema LNG Terminal Project is a private sector funded and driven project led by established international sponsors, such as Rosneft and Helios Investments. As such, there was no requirement for capital from government. The cost of the project is estimated in excess of some $350 million, of which $200 million would be spent directly in Ghana over the next 18 months. China Harbour Engineering Company, which is already involved in the current Tema port expansion project, is constructing the marine facilities, while Jiangnan Shipyard of China will be constructing the floating regasification facility. Present at the signing ceremony were the Minister for Roads and Highways, Kwasi Amoako-Atta, Minister for Railways Development, Joe Ghartey, Minister for Agriculture, Dr Owusu Afriyie Akoto, Minister for Information-designate, Kojo Oppong-Nkrumah and the Chief Executive Officer (CEO) of the Ghana Investment Promotion Centre (GIPC), Yofi Grant, among others.